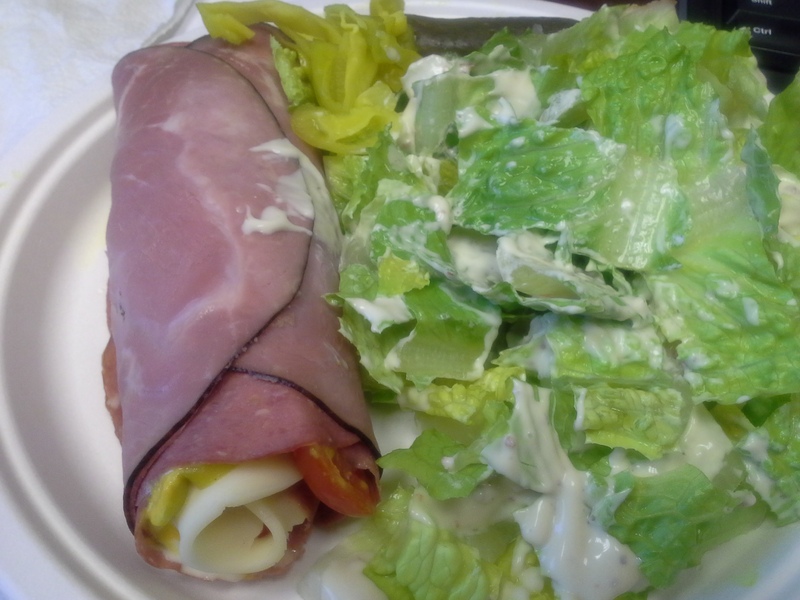 Lunch, for me, seems to be the hardest meal to do when sticking to a low-carb diet. Since I work full-time outside of the home, it’s not like I can cook something for my midday repast every day. I can only handle so many leftovers. And I definitely don’t want to be either going out or settling for just a salad every day. So another aspect of this 90-day challenge is to make sure I’m getting enough variety at lunchtime without taking up too much time in prep work. So I’ve sought out some sandwich/salad substitutes and will be sharing those along the journey, too. But it’s always good to start with the familiar and then stretch myself, so yesterday’s lunch was basically a sandwich and salad meal. Today’s recipe is one that should be taken as a basic idea and adapted to individual tastes (and to what’s available). I’ll share how I put mine together after the official recipe. It’s okay if there’s a V-shaped gap at top and bottom; your other layers will cover it up. Layer each additional meat on top. Dress one half with mustard and mayo or olive oil and oregano. This will be the inside or middle of your roll. Layer this half with tomato, banana peppers, and spinach over the mayo/mustard. (Additional items to consider: olives, red wine vinegar, cucumbers, onions). Roll from the filling side first as tightly as you can. To take it to eat later, wrap in parchment or waxed paper. As described above, I used the two slices of ham as my wrap layer—after patting them dry with a paper towel, which I think helped them hold together much better than if they'd still had a lot of water on them. I topped this with two rows of salami and then a layer of the corned beef. On the left-hand side of this meat canvas, I added a line of mayo and a line of mustard (as if I were putting these on a hot-dog in a bun). I then put the peppers and tomatoes on. The two slices of cheese went on top of all that (still working on the left-hand side) and then I rolled it. I decided to do the cheese last because it kept me from having to put my fingers into the peppers/mayo/mustard to roll it up. Next time (which will be tomorrow), I will leave out the tomatoes (still halve them, but put them on the side sprinkled with salt) and slice this into more manageable “wheels” to make eating it cleaner and easier. But it turned out very yummy. I love the meat rollups! Great idea! You know those appetizers that look like pinwheels. Those are so yummy and wouldn’t be hard to make and spice up a bit with different meats, cheeses, seasoning. I’m on it!